The popularity of online high school diploma courses has increased during the recent years with many seeking this platform on account of the flexibility offered by it. Online high school diploma courses are adopted by those who discontinue high school on account of some personal problems, or who have to stay away from school for health-related reasons or those who are employed and many other reasons. Browsing through the Internet can take you to a number of providers who present the opportunity to gain a high school diploma online. While some of these institutions are really good, others may not be so good. Typically, there are two types of online schools – the private online schools and the public online schools. The private online schools function independent of government regulations and usually charge a higher fee for the education. While some are accredited institutions, there are many schools which are not accredited by the regional associations. So recognizing the validity of the diploma offered by them in other colleges or offices is a prerequisite before getting admitted to a private online school. A public online school, on the other hand, has to follow the national and state government regulations for effective running of these establishments. There are also charter schools that are publicly funded with lesser governmental control than the public schools. A switch from the regular high school to an online school may not be acceptable for many students. It calls for a great deal of mental strength and self control to be successful. While the transition is easier for a few, identification of the advantages and disadvantages of making a switch is inevitable before making the decision. While going through the examples of students who have successfully completed online high school courses to receive their diploma, we find that flexibility is one of the key factors found to be highly advantageous in this platform. The online high school diploma permits students to work at their own pace, besides providing very little distractions unlike the regular school. It also gives the opportunity to specialize in those subjects that hold interest to the students. But many speak of missing the fun provided by the traditional schools such as the prom, graduation day, etc. in online high school diploma courses. Others have found that subjects like math were tough to comprehend in the absence of the teachers. 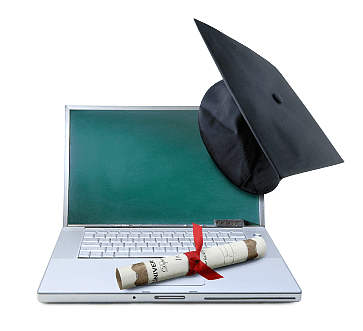 In spite of these limitations, the online distance learning platform is in great demand today.